Pop duo MXM has released concept photos ahead of the release of its debut album “More Than Ever” next week. The duo, Im Young-min and Kim Dong-hyun, released two sets of photos on Instagram on Monday, as the upcoming album is to be released Tuesday the following week in two different versions. The “More” version showed the duo’s youthful side, with the two in bright clothes and flashing a smile. 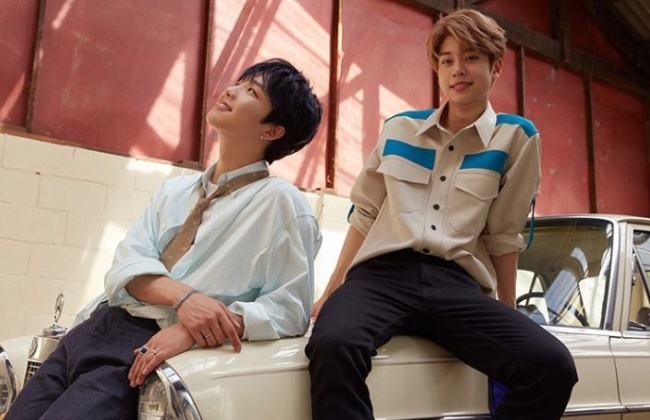 MXM looked more mature in the “Ever” photos, sporting more stylish outfits and with more serious facial expressions. The duo already boasts nearly 350,000 Instagram followers, an impressive number for a music act that has not released a single studio album. The duo’s agency Brand New Music said the two were in deep with the making of the album, as well as fashion styling and visual directing, giving the album a personal touch.